The movements of ballerinas are like the graceful brush strokes of a watercolor artist. They are flowy, light, and far more complicated than they look. 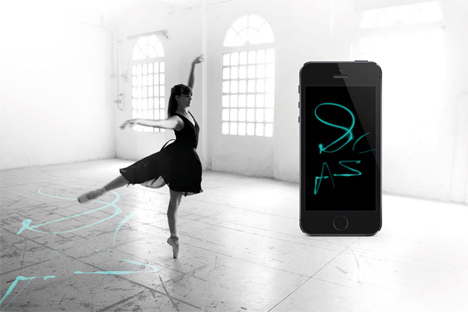 Designer Lesia Trubat has developed a way to capture those brush strokes of movement by outfitting pointe shoes with electronics and connecting them to a proprietary app. She calls the system Electronic Traces, or E-Traces. A Lilypad Arduino microcontroller board attached to the bottom of each shoe records the pressure and movements of the feet and sends the information to a mobile device. 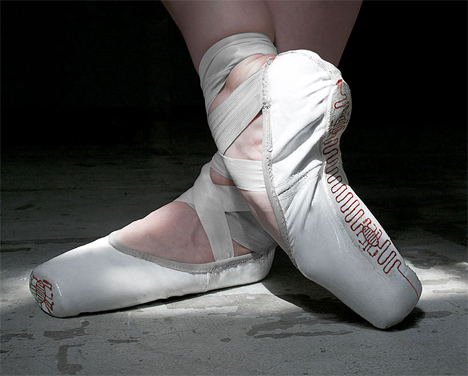 From there, the dancer can see their foot movements drawn out on the screen in graphics. They can view the movements as a video and even print out extracted images. The movement data can be used to track dancer’s progress in learning a particular routine, compare their moves with those of other dancers, and make corrections to foot placement. Trubat feels that the technology could be used for dance styles other than ballet and would be particularly helpful to those who are just learning or who are self-teaching. See more in Art of Tech or under Technology. December, 2014.